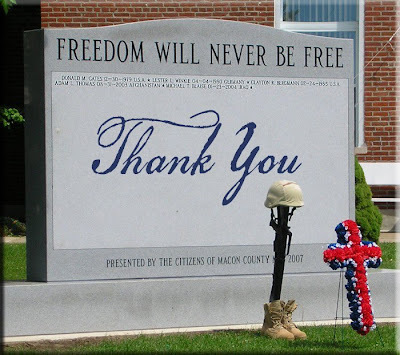 When so many have given their lives for my freedom "Thank you" sounds so trivial, such a small expression of gratitude. I've been reading posts about this Memorial Day all weekend and there are some sentiments and statements that stick out more than others to me. Beginning with the title of this post. It was a title used by a young man serving over in Iraq who blogs as Blackfive and has lost several friends that he served side by side with. On his blog today he wrote a tribute to those men and his tribute was how he valued the opportunities that he has in his marriage, with his children and with his family because the price of their lives paid for that opportunity for him. He's living their tomorrows and not taking one day of it for granted. I know we all have our Faces of Freedom. They are sons, daughters, brothers, sisters, mothers, fathers, friends, neighbors. Today we memorialize those who have served because America's greatness was something they believed in with their lives. 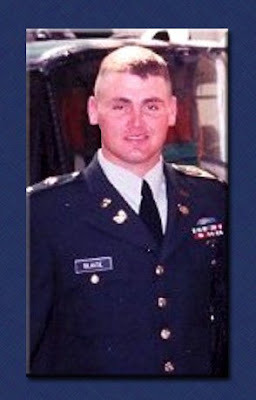 For me that Face of Freedom is Chief Warrant Officer Michael Blaise. Our community lost this young man only weeks before his tour of duty was finished and he was to return home. Our church was planning the welcome home festivities and that feeling of relief was already in the air that Michael and his wife Kate would finally be home safe and sound. I'll never forget that phone call from our pastor telling us Michael's helicopter went down on January 23, 2004. I had a real hard time accepting that this young man, who was so ready to come home and start his life with his wife, settle back into his hometown surroundings, was not returning to this home. God must have had a greater purpose for a warrior such as Michael. Five years later I still see Michael as the last time I'd seen him, brush hogging the ditches up the road. He was so in his element on that tractor. I see him walking up to my husband's shop with a huge smile and I can still hear that, "Hey Boss!" greeting. On Memorial Day when we visit his grave and say thank you it's with more of a heart with a promise to Michael that we will live the tomorrows he gave to us doing all we can to fight for the freedom he gave his life for. Having the honor of knowing Michael is and always will be the drive behind the passion for standing up for the convictions and the love I have for our country. We will always have a tremendous respect for the ultimate price Michael paid for our freedom. There is a peace in knowing that he spent his life on what he believed was worth fighting for, the United States of America. And in the words of Blackfive, it's up to us to honor [those who gave their lives] by ensuring that our future was worth the sacrifice of their tomorrows. I've been waiting for Chairman Michael Steele to give his speech before posting this week. To tell you the truth, I didn't have much hope and figured it'd be more of the same cowering at the thought of upsetting political progress. I have to admit I was completely impressed with Michael Steele. I actually felt like I was listening to a leader, not someone who was trying to do what everyone else is suggesting is the right thing to do or being afraid of saying the wrong thing. He spoke with power, he spoke with confidence and it was one of the most sure footed speeches I've heard out of a Republican in a long time. And I finally heard words of respect that nobody has had the courage to speak, "We are going to take this president on with class. We are going to take this president on with dignity. This will be a very sharp and marked contrast to the shabby and classless way that the Democrats and the far left spoke of President Bush." That was standing ovation material there. President Bush was a true leader who stuck to his convictions no matter how unpopular it made him. The disrespect he was and is shown is atrocious. I realize that the criticism of Chairman Steele has been because he's trying to move the Republican Party to the middle, to be more moderate. I didn't hear that in this speech. I personally am a "radical right wing Republican extremist" according to the Homeland Security report. 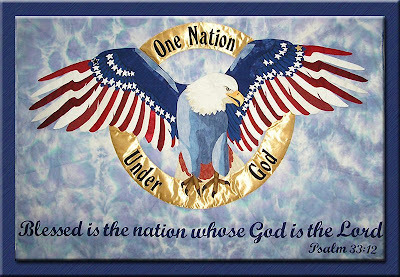 I'm a born again Christian, I am absolutely pro-life, I believe strongly in our Constitutional rights to bare arms, I think every single person that is in our country illegally should be rounded up and sent back to their own country, now. I "chatter on the internet" informing people of the bills that the government is putting through at warp speed, I am extremely pro-Constitution, I am anti-welfare/entitlement as a lifestyle and I'm anti-government bullying away the liberty and freedom of the American citizens while draining their pockets for generations to come. 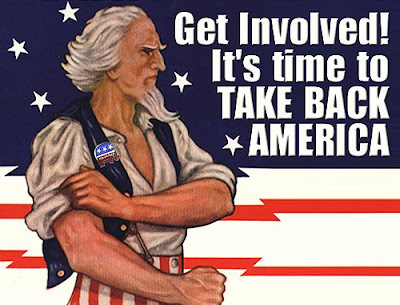 I realize that there aren't going to be many politicians that 100% represent all of the things I stand firm on (although I'd give about anything to find just one) so my quest is to support the politicians that represent the majority of those things that I am passionate about for my family & country. Lately I've read a lot about how Republicans need to "reboot." Everyone's got ideas about what it's going to take to get the Republican party back on it's feet and be desirable to the younger generation. Megan McCain has come out as a liberal Republican acting like she's talking for all the young men and women of her generation. Sorry Megan, I have 3 children your age and you do not even come close to representing their voice for this country. She's delusional and has enough political fame in her family to make her comfortable in the spotlight, but she's only noise. She's attracting only the liberal media who will feed off her then spit her out when they're done. I believe the young men and women today are looking for leaders. When candidates stand up and start showing fearless leadership people will listen, they will support and they will follow. The younger generation is smart, I've watched them at the Tea Parties, I've listened to them. They're brilliant, they're powerful and they're dedicated to being informed and being a diligent part of holding our politicians accountable. They're fed up and they're driven and to tell you the truth it's refreshing and exciting to me to see the younger generation so on fire for their country. One young man from St. Louis recently wrote, "Since October, many people scoffed at conservative and libertarian warnings that an Obama administration would move quickly to bring about true Soviet-style socialism." He went on to list several of the anti-constitutional, socialist accomplishments of the current administration. And he asks, "Most Americans are too timid and frightened to resist. Have you heard an outcry from our esteemed Republican Senators? None. Representatives? Silence. Michael Steele? Cordiality. Democrats, too, claim to support to liberty and free markets. Where is their outrage? Where is the legislation to stop Barack Obama from molesting the Constitution? Where is it? Where the hell are the American leaders?" The former vice president stands on his principles and doesn't care who criticizes him for it. Recently in a radio interview VP Cheney said, “I think it would be a mistake for us to moderate. This is about fundamental beliefs and values and ideas … what the role of government should be in our society, and our commitment to the Constitution and constitutional principles. You know, when you add all those things up, the idea that we ought to moderate basically means we ought to fundamentally change our philosophy. I for one am not prepared to do that, and I think most of us aren’t. Most Republicans have a pretty good idea of values, and aren’t eager to have someone come along and say, 'Well, the only way you can win is if you start to act more like a Democrat.'" He went on to say, "I think periodically we have to go through one these sessions. It helps clear away some of the underbrush ... some of the older folks who’ve been around a long time — like yours truly — need to move on and make room for that young talent that’s coming along." The Republicans had the greatest example of leadership, Ronald Reagan. He wasn't afraid to stand, unshakeable, on his values out loud. Katie Howard from Mother of All Conservatives, said it best, "We don’t need another Reagan, we need to remember the one we had, what he inspired and encouraged us to be… to do." Now it's up to US. And I'm going to close with a quote by an incredible young woman, one of the organizers from the St. Louis Tea Party, Dana Loesch, "I for one am tired of snake oil salesmen trying to bully conservatives away from their convictions. I agree in that we can’t rely solely on Reagan’s policies and cross our fingers that our mere existence will attract our fellow youth, but to abandon those principles altogether because they seem “dated” demonstrates unfamiliarity with the relevance of conservatism in the 21st century, if not conservatism itself. Conservatives need to focus on the ways in which they can exhibit how conservative ideology is still relevant - and popular. Strengthen the message, don’t back away from it." I'm praying that we see bold action from Chairman Steele and not just words. I am praying for men and women to be inspired to rise up and take their passion for serving, be a voice for The People and become bold, fearless leaders with a relentless commitment to the Constitution and constitutional principles. It wasn't all that long ago we heard the reassurance that, then candidate, Obama was not interested in our guns. Just like every single other thing that came out in all the campaign promises he has other plans for our 2nd Amendment rights. He wants to turn our rights over to an international treaty, he's pushing to see our gun ownership regulated and monitored by other countries. Last week, the Senate Foreign Relations Committee held a hearing on the nomination of Harold Koh, a former Dean of the Yale Law School, to be Legal Advisor to the State Department. One of the many concerns with Koh is his belief that international organizations should be empowered to regulate the Second Amendment right to own a firearm. 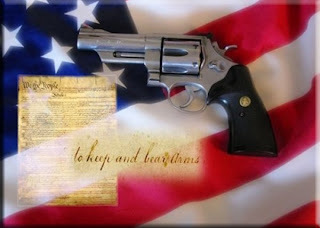 Koh supports the idea that the U.N. should be granted the power “to standardize national laws and procedures with member states of regional organizations.” Koh feels that U.S. should “establish a national firearms control system and a register of manufacturers, traders, importers and exporters” of guns to comply with international obligations. This regulatory regime would allow U.N. members such as Cuba, Venezuela, North Korea and Iran to have a say in what type of gun regulations are imposed on American citizens. Taken to their logical conclusion, Koh’s ideas could lead to a national database of all firearm owners, as well as the use of international law to force the U.S. to pass laws to find out who owns guns. All who care about freedom should read his speech (pdf). Senators need to think long and hard about whether Koh’s extreme views on international gun control are appropriate for America. Contact your representatives and voice your opinions.